Santa Fe Opera has once again earned international accolades for it’s premieres of iconic contemporary American operas with this season’s extraordinary offering from Mason Bates (Composer) and Mark Campbell (Libretto) in The (R)evolution of Steve Jobs. 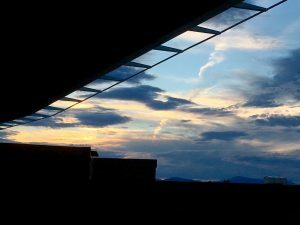 Santa Fe Opera has always been a confident leader in producing new operas, and has never taken a “wait and see” approach with premieres of American composers’ works. For that the SFO gets First Prize! What matters most is the work itself – that the music is being composed and produced for all to experience. It is of little consequence that some people might not like it. However, people liked it a lot! The applause and standing ovation was so energetic that it definitely rattled the roof of the Crosby Theater with shouts that likely echoed for miles around. Bates’ picturesque music designs dramatic orchestral phrases with a counterpoint of electronica to illustrate the unfolding story onstage, written in 18 scenes in one act lasting about 95 minutes. Bates utilized a “leitmotif” composition idea for his characters, which he called a sonic identity: for Steve Jobs it is music of acoustic guitar and electronica set against lyrical vocal phrases; for wife Laurene, gentle strings; for “Woz,” jazzy saxophones came into play; and for his spiritual mentor Kobrun, Tibetan prayer bowls, Chinese gongs and Asian flutes augmented with electronic enhancement completed Bates’ inventive sound palate. This intriguing sonic world accompanied Steve Jobs’ dramatic path to creative fulfillment and elusive inner peace while he created the Apple empire. Michael Christie was in command and masterfully conducted the unique juxtapositions of sound in this score. The demanding role of Steve Jobs was compellingly sung by baritone Edward Parks, who was onstage for every scene; Sasha Cooke gave us the full breadth of her luscious mezzo voice in her meaningful role of Jobs’ wife Laurene; Garrett Sorenson as Steve Wozniak “Woz” was a strong and dynamic partner for Jobs; while eloquent, lyrical singing from bass Wei Wu as Jobs’ spiritual mentor Kobrun stands out as a highlight of this show. A set designed by Victoria Tzykun expertly echoed Jobs’ sleek designs. Following the opening scene, the walls of the Jobs’ garage began to dance in six moving cubes with screens that resembled huge iPhone screens that projected the scenic imagery – from a northern California sunset, to a computer circuit board, to the Japanese enso symbol depicting the simplicity that informed Jobs’ life. Director Kevin Newbury kept the focus on Jobs’ conflicted personality and underscored the creative torment Jobs endured. Newbury gave us a visual prize – one which couldn’t be decoded until the last scene, when it all came together and the audience’s ovation pronounced another triumph. Newbury integrated sleekness of Apple designs, against the emotional backdrop of a life lived in the service of innovation at such a great price. Woz told Jobs “You can have all the money in the world and all the time, but if you can’t find joy in what you do – who can?” And so we feel the tragedy of the driven creative genius. Jobs announced “one device is all you need … to capture and control all those messy moments in your lives”. And yes, there’s that little iPhone waiting in our pockets – our prize and a daily reminder of Jobs’ gift of genius. Although many opera aficionados journeyed to Santa Fe Opera to celebrate an American premiere, lots of us returned to the opera house atop a Tesuque mesa to hear familiar singers in new productions of traditional operas crafted to delight and dazzle. Lucia di Lammermoor featured Brenda Rae in the title role, as Rae now emerges to take her place among the legendary list of coloratura sopranos, courageous and amply skilled to conquer this bel canto masterpiece. Rae’s singing sparkled with spinning fioritura, soothed with nuanced pianissimos and messa di voce, and compelled the heartstrings of her audience with its dramatic complexity – her Lucia has it all! Brenda Rae can confidently follow after Beverly Sills, as our coloratura queen! Tenor Mario Chang made a brilliant SFO debut as Edgardo, his expressive lyrical singing made a gorgeous counterpart to Rae’s Lucia. Zachary Nelson’s baritone Enrico was as strong as he was malevolent in demanding his sister Lucia’s ultimate sacrifice to marry another. Corrado Rovaris deftly conducted and commanded reverence throughout for the bel canto style, while the SFO chorus beautifully executed their supporting music. A very special touch was SFO’s inclusion of the glass harmonica to accompany Lucia’s Mad Scene, with its eerie, ghostly incantations. The very minimal boxy set design by Riccardo Hernandez offered a metaphor for Lucia’s fate, increasingly closing in around her to eventually crush her life. Director Ron Daniels chose a traditional “stand and sing” model of stage design to offer the story. Since bel canto opera is about beautiful singing – we were grateful that’s indeed what we got. This Lucia was in fact some of the most beautiful singing I’ve heard – and it will haunt my memory for a long time.